Following the auction of the Morley Hall Estate in 1921, the Mid-Norfolk Golf Club was established on land to the West and South of the Hall. 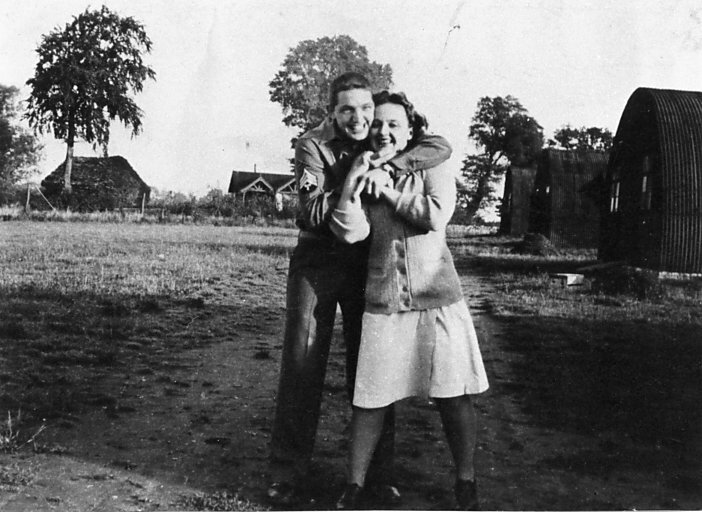 There were two associated buildings, a clubhouse and a professional's bungalow, built next to Golf Links Road (then Golf Links Lane) and both of these survived through to the 1950s when the site became Wymondham College. 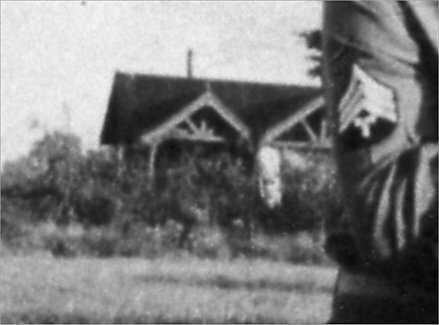 This photograph shows the clubhouse as it was in 1944/45 when the 231st Station Hospital was in being. The haystack to the left stood on the other side of the lane. 1946 aerial photo of the area. 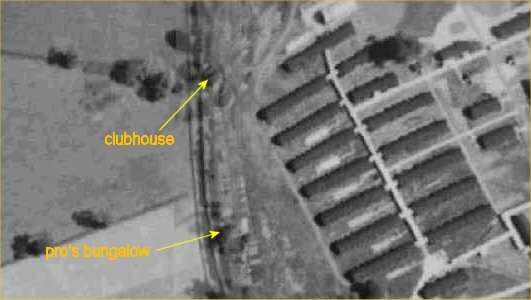 At this time the clubhouse is believed to have been occupied by squatters. 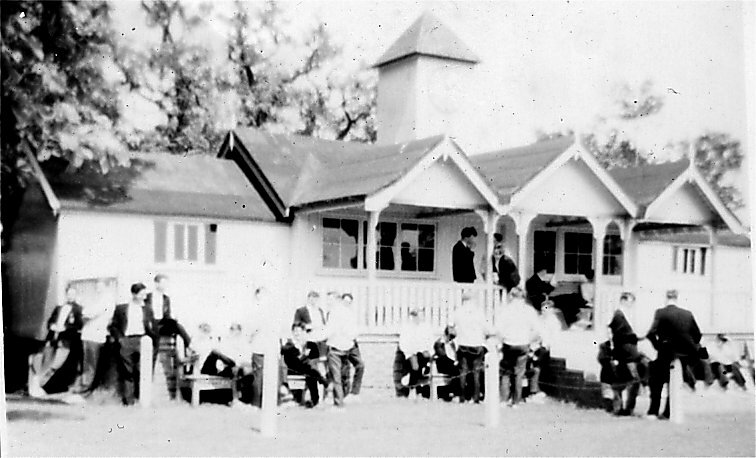 It was Mr. Metcalfe's idea to give the old building a new lease of life as a cricket pavilion, using the school's own resources - the usual pattern of things in those days. Staff leadership was split between Bob Mullenger, Andrew Seeley and Dave Goman, with the boys of the school utilised as their labour force. Work began in earnest after exams in the summer of 1958. 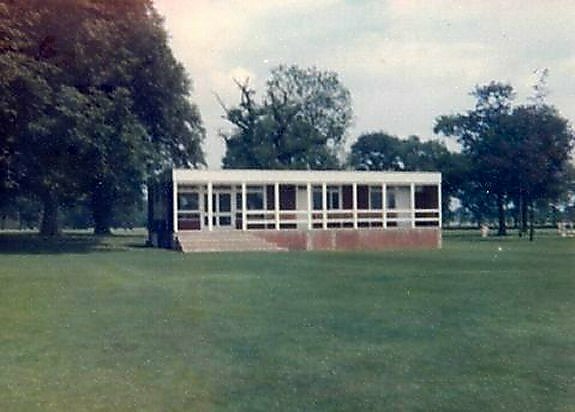 A brick plinth was built by the College's maintenance staff (over the winter of 1958/59) and the sections of the clubhouse were assembled on it, with the addition of an extra room to give symmetry to the pavilion design. Four benches, embellished with the College crest, were built in the workshops under the supervision of Bob Mullenger. Mr Metcalfe's Speech Day report in November 1959 included "The Cricket eleven was able to use the new pavilion, the golf house of pre-war days erected on the lane, although it still needs another coat of paint before the official opening next year. Our thanks are due to the staff, particularly Mr. Seeley, and the boys, who by voluntary effort made this possible and in addition helped with the laying of the new cricket square." 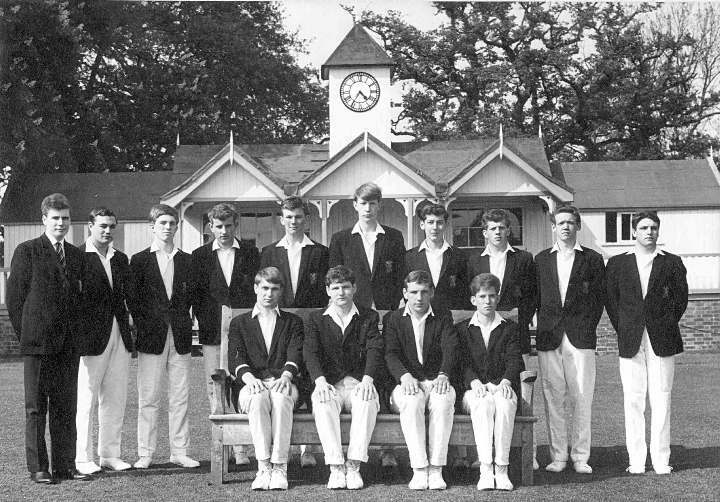 The first team photograph taken in front of the pavilion was that of the 1959 1st XI. It was not featured on rugby photos until the 1960/61 season. 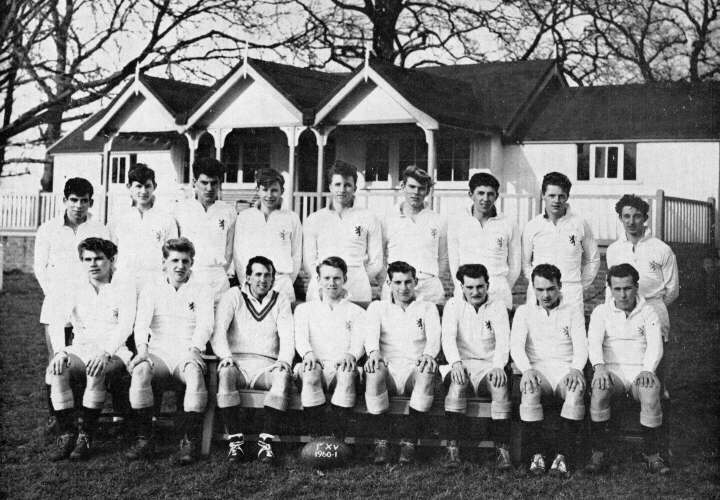 The 1st XV for 1960/61. Note the absence of a clock tower at this time. A clock tower was added in early 1962 to the design of Bob Mullenger and housed a clock donated by Norwich Union. The clock was first installed in the City of Norwich Waterworks Company premises in Surrey Street (built 1905) and was weight-driven, the weight - on a long wire running on a series of pulleys - being wound up once a week. Norwich Union acquired the buildings in 1938 and they were demolished in 1959, at which time the clock went into storage. It isn't known how the clock came to be transferred to the College (i.e. based on an offer or a request) but it was refurbished in the workshops before being installed. The 2nd XI of 1965 in front of the completed pavilion. A group of spectators in front of the pavilion in the early Sixties. Sorry about the quality, but the image came from a small over-exposed snap. 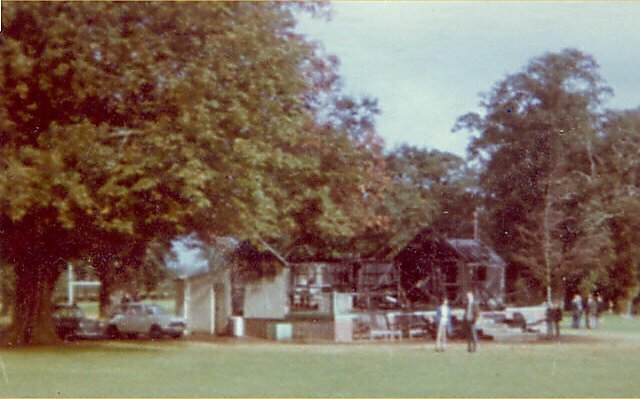 On the first day of the Autumn Term in 1972 the pavilion burned down, almost certainly as a result of arson. The culprit was never found. Phil Robinson relates that "The 1st XV rugby squad were 'prime suspects' for a while, as we had been back 2/3 days before the return of school for 'pre-season training,' i.e. most evenings spent in the pub on the old A11 (now a house) or at the cinema in Wymondham. I always thought that one of the CGS pupils was responsible by having had a crafty fag in the ball store at lunchtime (not many actual Wycoll pupils were back at that time)." No doubt the possibility of a complete rebuild was considered but it was evidently considered to be too expensive. 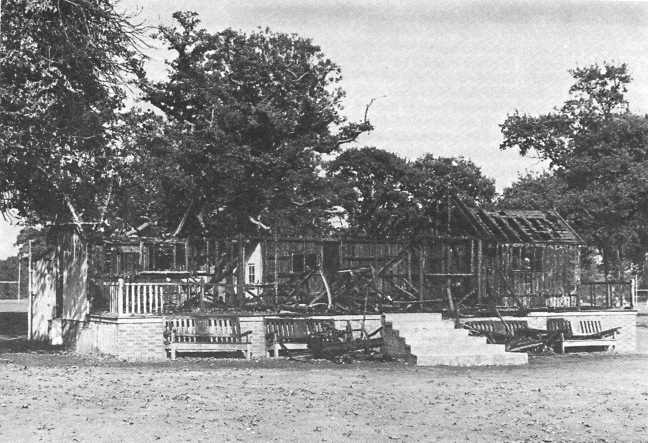 The remains of the pavilion, September 1972. The replacement. The steps and part of the plinth are all that remain of the original building.